A forum for engagement among high-profile government and industry leaders from Canada and India, to exchange sector specific intelligence and develop strategies for cooperation in the Mining/ Metals sector. Canada is the world’s largest repository of end-to-end domain knowledge and expertise within the mining and metals sector, covering the full range of resource-related activities from prospecting and exploration to mining operations, commodities and market development and world-class legal, M&A and financing capabilities. economy. Canada and India are natural partners within the mining sector. 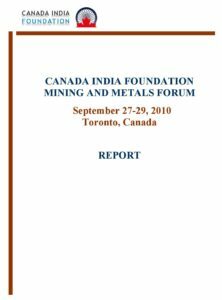 Canada India Mining and Metals Forum provided the framework for the development of enabling strategies and policies by stakeholders from both countries in the mining sector. • Dr. V.I. Lakshmanan, Vice-Chairman and CEO, Process Research ORTECH Inc.
• Mr. Pankaj Dave, President, Manas International Inc.